Mary Louise is a part-time, high-priced call girl who plays a key role in Hawke's Point and the sequel, Hawke’s Return. In the first draft of the first novel, she was a minor character, with just a meant-to-be-funny cameo appearance early in the book. But when I presented those chapters to a writing class, all the questions were about her. They wanted—no, they needed—to know more: Why does she do it? What’s it like? How can she think of it as just a job? How can she possibly stand being in the same room with her customers, let alone being intimate with them? I took the bait. I gave her a bigger role and a more complex personality. If people wanted to read about her, I’d try to give them someone worth reading about. I even became attached to her. This meant learning as much as I could about the life of a woman in her shoes. That wasn’t a problem. I’ve been a journalist for over 40 years; I knew how to find information even before there was an Internet. There were some hiccups along the way. 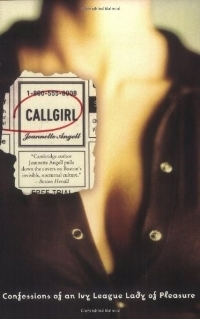 My wife was none too pleased when my copy of Callgirl: Confessions of an Ivy League Lady of Pleasure came to the front door in a clear plastic wrap. There were plenty of other warning signs I ignored on the road to publication. When I asked other writers (who really should know better) for critiques, the conversations would focus on elements of plot, point of view, style, dialogue, whatever—and then inevitably they would get around to Mary Louise and how I did my “research,” the word often spoken as though it had skeptical quotation marks around it. I figured there was an easy if incomplete way to defect questions. I went out of my way in the acknowledgments for the novel to cite a couple of the books I used as references, but that hasn’t had much effect. The questions keep coming. Usually, they begin by asking whether the book is autobiographical. It’s not, and anyone who knows me should know that. But then they ask where the characters came from. Are they based on people I know? Telling them that they are partially composites and mostly imagined will get a polite nod and awkward silence, as though they’re waiting for me to fess up. A few reviewers have also focused on Mary Louise. Two said she was their favorite character, which surprised me, but one accused me of glorifying prostitution and gave me a firm, very personal lecture. As the questions continue, I’ve stopped trying to explain in any detail. It doesn’t do any good, and the last thing I want to do is sound defensive. So I just pause a few seconds as though I’m taken aback by the question. “Research,” I finally answer with my best inscrutable smile. Let them think what they want.